Dir. Catherine Hardwicke. USA/Canada. 2011. Drawing blood from a classic! This contemporary take is inspired by the famous fairytale involving a young girl fixated with red, her ailing grandmother and a big bad wolf. This story is clearly a huge take-off from the original almost bloodless (in comparison) fairy tale. At the helm is Catherine Hardwicke who opened with ‘Twilight’ - the vampire-werewolf hokus-pokus that scored a massive hit with the teens The re-imagined script by David Leslie Johnson gives her ample scope for flamboyance on her pet theme- super-natural triangular love story with murder and mayhem as it’s backdrop. The film is fashioned as a thriller whodunit with small-town superstition and religious paranoia providing the basis for the conflict. The film plays out very much like the familiar ‘Twilight’ series. In the isolated hamlet of Daggerhorn, the residents are in a tizzy. On the red “Blood Moon day’ which arrives once in a blue moon, the wolf which they had kept at bay by providing regular livestock sacrifices decides to break the covenant by claiming the life of a young maiden. Her parents (Virginia Madsen, Billy Burke) are devastated and her crimson cloaked sister Valerie (Amanda Seyfried) is flabbergasted that she can communicate with the monster. Lymaybe she canthropy expert Father Solomon (Gary Oldman) warns the villagers that the werewolf dwells among them. Valerie also believes that she may know the evil soul personally. So her long time sweetheart Peter (Shiloh Fernandez), her unloved fiancé Henry(Max Irons) and even her good old grandmother (Julie Christie) who alternates between sweet and sinister, come under suspicion. The body count escalates but the blood and gore are kept to the bare minimum. The film reeks of feminist clichés as well as werewolf/vampire ones. When Valerie runs off with Peter into the forest , they snare a rabbit. It’s Valerie who ends up putting the knife through the bunny because Peter refuses. She could be predator too-not necessarily helpless. She is also the one who eventually vanquishes the evil wolf. So it’s feminine power at the forefront here. The camera soars accross landscapes covered with snow where a woman in a red cloak appears to be the only bright colour in an otherwise unrelieved whitenesss. It’s stunning alright but what’s the purpose? The modern twists don’t really come together with finesse. Hardwicke fails to thread together a convincing narrative. The drama never reaches fever pitch, there is very little tension and the production values appear inconsistent. I was curious before I saw this re-envisioned fairy tale , now I am just sad! 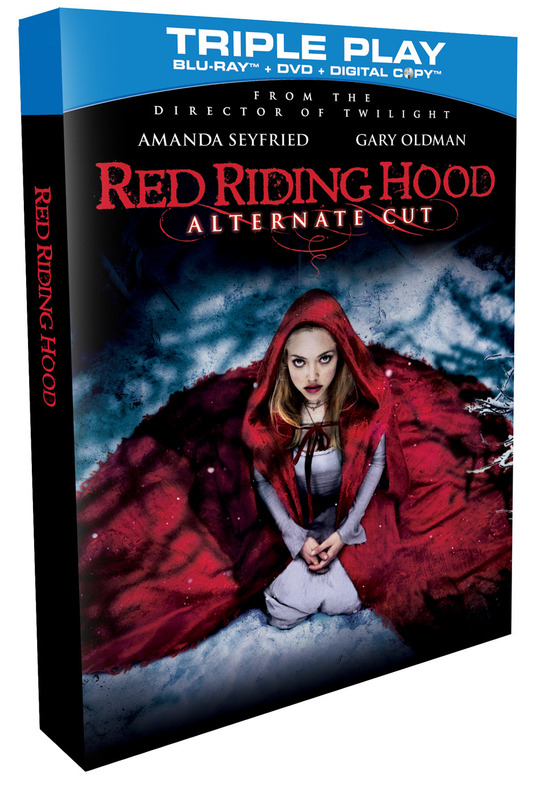 Red Riding Hood is out on Blu-ray ™ Triple Play, DVD and digital download on 22 August 2011. The Red Riding Hood Blu-ray Triple Play features an alternate ending and a digital copy of the film. Red Riding Hood DVD contains Deleted Scenes.